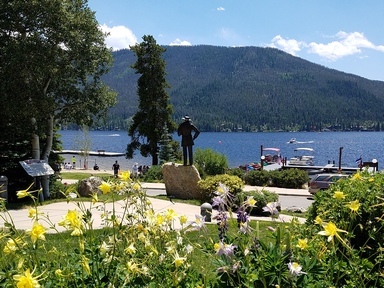 The Grand County Department of Economic Development efforts to expand Grand Lake’s seasons by developing a creative economy have received a big boost. The town has announced that Grand Lake has been certified by the state as an official “Creative District,” with a celebration planned for 4-6 p.m. Tuesday, July 24 at Squeaky B’s in Grand Lake. Community members throughout the county are invited. Colorado Creative Industries focuses on defining specific geographic areas that can attract artists and creative entrepreneurs to a community. With this designation, the hope is to infuse new energy and innovation in a region while enhancing the economic and civic capital of the area. The impact of the Creative District has gotten off to a strong start through a generous land-use donation at the former Sombrero Stables property at the gateway to Grand Lake. The Rocky Mountain Wooden Boat School has started operating there, with plans in place for other hands-on creative uses in the new space. Three students in the East Grand School District are currently working with Rocky Mountain Wooden Boat School Director Ken Fucik to repair, refurbish and otherwise rejuvenate the wooden boats that have come to be a trademark for Grand Lake, Colorado’s largest natural lake. The students are learning woodworking, welding and mechanical skills that are required to refurbish the signature wooden-style boats of Grand Lake. With these skills, the students can move on to start their own wooden-boat refurbishing businesses or expand to other related areas similar to the wooden boat restoration business. As well, Butler says the MakerSpace at Sombrero Stables is being envisioned as a location where other hands-on artistic skills can be taught, nurtured and developed. For example, wood carving, wood branding and steel and metal fabrication for use in artistic or marketing materials can be taught out of the MakerSpace. “The space is focused on nurturing and developing young adult and youth creative industry skills that can be used to sustain art forms typical of the Grand Lake area,” Butler said. The MakerSpace at Sombrero Stables is the first stage of an integrated plan to expand the creative economy of Grand Lake, butler says. Grand Lake is working with Colorado Creative Industries, the Boettcher Foundation and the Colorado Department of Local Affairs to secure funding and support to expand the economy of Grand Lake and capitalize on its recent designation as a Colorado Creative District. The Creative District designation is important because it opens doors to funding and planning opportunities in the town, all geared toward expanding that aspect of the tourist and seasonal economy of Grand Lake. Another aspect of the work taking place in this arena relates to efforts to integrate affordable, artist-friendly housing into the development mix of Grand Lake so that artists can afford to work and market their wares in Grand Lake, creating a symbiosis with the tourist economy. Butler and the creative group proponents feel the impact of their work in Grand Lake could expand. Butler is also working with her group on collaborating with other landowners in Grand Lake so that new spaces in town that need new life can be integrated into the Creative Industry and MakerSpace mind-set, creating a new and growing creative culture in Grand Lake.